Well, this is a question that writers deal with on a daily basis. How can you come up with an idea that will set your content apart, grab readers’ attention and garner engagement through the end of the piece? Before you come up with a topic, it’s incredibly important to think about the needs and preferences of your audience. 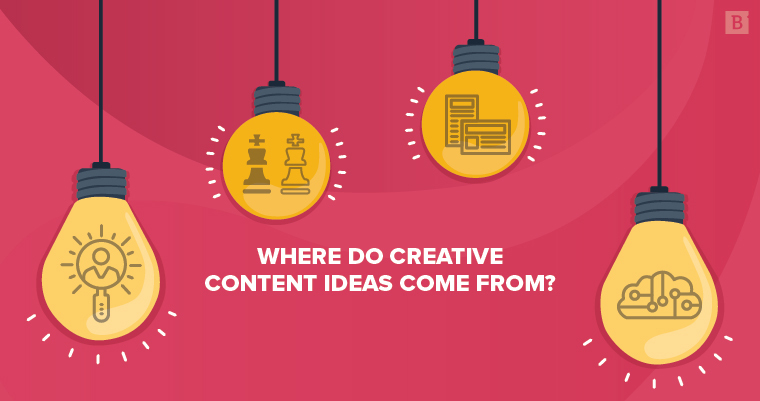 The readers you’re writing for will likely have specific questions about a certain subject, and pondering these queries ahead of time while aiming to answer them in the content can help you come up with a creative approach that maps to all of these demands. Who, exactly, am I writing for? What types of people are included in my audience, and what kinds of roles do these individuals hold? What is the purpose of my writing for this audience? What message am I looking to convey to them? How will I accomplish sending this message in a way that engages the audience? How can I meet their needs for valuable and entertaining content while still supporting my purpose for writing? We also recommend thinking about the types of things your audience might do in their free time and incorporating this into the writing to help spur interest. For example, if your audience is made up of information technology decision-makers, think about the types of leisurely hobbies they might have, the kinds of books or magazines they might read or the movies they’re drawn to. Taking cues from these interests can be a huge help in sparking your creativity. Another area that’s ripe for creative content ideas is the competition. Competitive research is a valuable approach, but it’s important to keep originality in mind. When scoping out the competition, you shouldn’t just look to borrow their ideas but to take them a step further. This improvement upon the original can – and should – lean toward your own organization’s goals and result in content that works well for your audience and furthers your mission. What ideas or types of content are trending? If you see several competitors achieving engagement for time-lapse videos, for example, it may be worth creating one of these for your organization. What keywords come up in your research? SEO should always be incorporated, and it ensures that you’re creating content that aligns with what your audience is searching for. Who is following whom on social media? Taking a look at who follows your competitors can provide a creative spark for your ideation. For instance, if your competition is followed by people using certain phrases in their Twitter bios, creating content that appeals to this audience can be advantageous for growing your company’s reach. 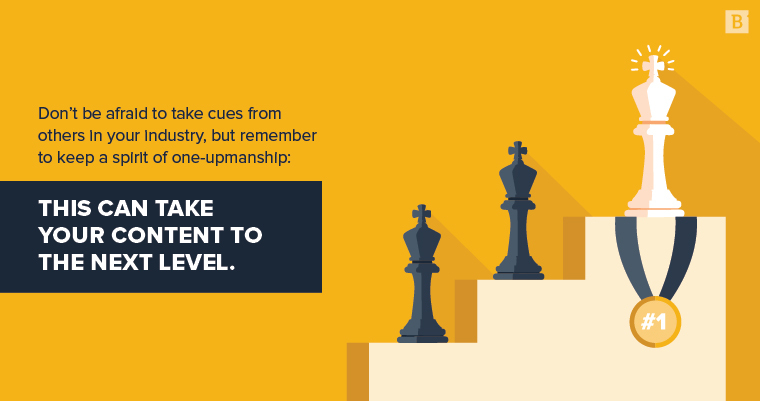 Don’t be afraid to take cues from others in your industry, but remember to keep a spirit of one-upmanship: This can take your content to the next level. When it comes to content, the phrase, “If it ain’t broke, don’t fix it,” surely applies. In other words, if you find a formula, a certain layout for content or a template that works well for your audience, don’t shy away from reusing it. From a psychological perspective, people like repetition and things that feel familiar, even if they don’t realize it at first. Drew Boyd noted for Psychology Today that many highly successful creatives earned their status through the use of templates – The Beatles did it, author Agatha Christie did it, and there’s surely many more included in these ranks. Boyd calls this Systematic Inventive Thinking, an approach that allows you to repeatedly apply a certain pattern to a product, service or process in a way that regulates thinking without stifling creativity. Fancy terms aside, it’s important to understand that you can leverage and repurpose a creative idea more than once. If you found success with a certain kind of infographic, for example, don’t assume that lightning won’t strike twice if you use the same approach for a similar topic. When all else fails – or even as a starting point – brainstorming can provide the spark that can get you from a blank slate to an original and engaging piece of content. Whether you’re brainstorming by yourself or in a group, remember to keep a sacred space in which no idea is a bad idea – any hesitation or questioning can smother your intuitive creativity. It can be helpful to bounce ideas off of those without a stake in the project. Grabbing Jan from accounting can provide the set of fresh eyes you need to see things from an outsider’s perspective, while avoiding being dragged down by your own preconceived sentiments. In addition, be sure to include participants from other departments. A designer, for example, may be able to shape the writer’s idea in a way that will map to a specific visual layout, helping to garner attention while supporting an important message. Everyone has their own process when it comes to creative content ideas. How did you come up with your best ideas? Tell us below!